I refuse to believe Spring is not around the corner. I know it's not even 40 degrees here in West Michigan but the sun is shining and I know Spring is coming. We are essentially half-way through March so, again, I know Spring is coming. As I begin to pack away my winter wardrobe I can sense Spring coming even more. As I've mentioned before, there are a few fashion rules I follow for my style including - I don't wear wool once March 1st arrives. I don't wear white before Easter, I don't carry a straw bag until Easter. Just a few. Just me. Just my style. If you read my musings and Instagram posts regularly (if you don't ....why?? sign up now- box to the left of this) you already know - I love versatility in my wardrobe. I want to know pieces can be worn in different ways to get the most from my closet. This sleeveless top is no exception. Spring dressing is tricky, here it must be done in layers. 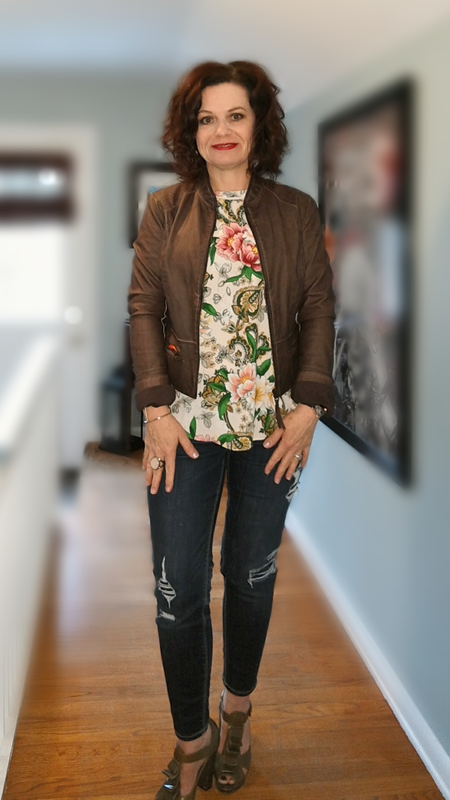 I love the addition of this floral print to my wardrobe and the ability to wear it so many ways, especially with my Spring staple layering pieces of cardis and jackets. I have to say, it was a stretch for me to add the velvet shoes today and I loved the look! What are you adding for Spring? How are you dressing for the beginning of the new season? I'd love to hear.